Who would argue with Bryson DeChambeau’s unique approach to golf now? Bryson DeChambeau watches the flight of his tee shot on the 16th hole during the final round of the Dell Technologies Championship. NORTON — Bryson DeChambeau’s reputation in golf has been established for years, mildly surprising considering he’s just 24 years old. But when you’re as different as he is, word is going to spread. “I’ve always been a guy that’s been weird and unique relative to everyone else,” DeChambeau was saying Monday evening, the sun setting over the golf course he had just made look ordinary. He’s the kid in the Hogan cap who approaches the game nothing like the greats of the past, but rather an iconoclast willing to upend tradition, a mad scientist eager to buck convention, a thinker, tinkerer, and all-around mystery. Even as he would use his custom-made, single-length set of clubs on the tee and his vector-measuring putting plan on the green and ride them to both the NCAA individual title and US Amateur crown, skepticism abounded. From college coaches who had stopped recruiting him to a father who tried to talk him into using conventional clubs, from the peers who looked sideways at him to the fans who didn’t know what to make of him, he heard the doubters. Who would argue with his vision now? 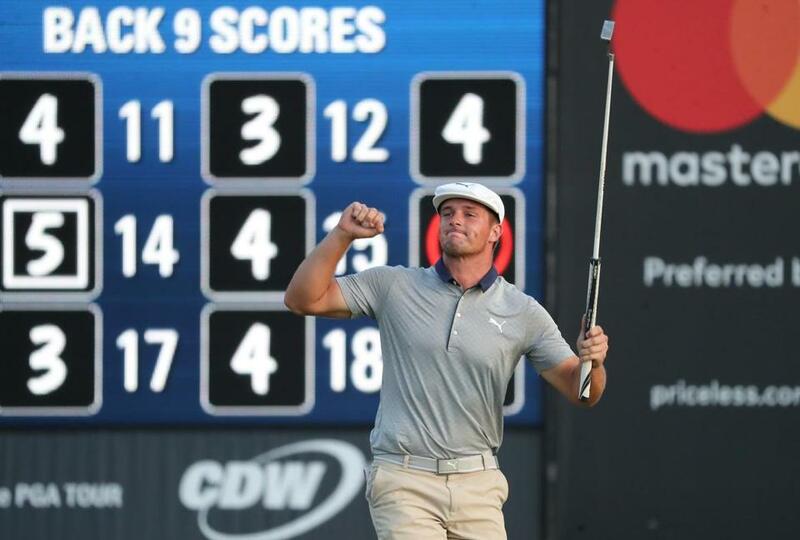 With one more dominant round Monday, DeChambeau won the Dell Technologies Championship, his 4-under day and 16-under finish putting him two shots clear of the rest of the TPC Boston field. And in winning for the second straight week — the first man to take the first two legs of the four-tournament, year-end FedEx Cup playoffs since Vijay Singh in 2008 — DeChambeau does so much more than take a commanding lead in the points race toward the Tour Championship or make it impossible for Ryder Cup captain Jim Furyk not to announce him as one of his at-large picks Tuesday in Philadelphia.
.@B_DeChambeau is getting used to this. 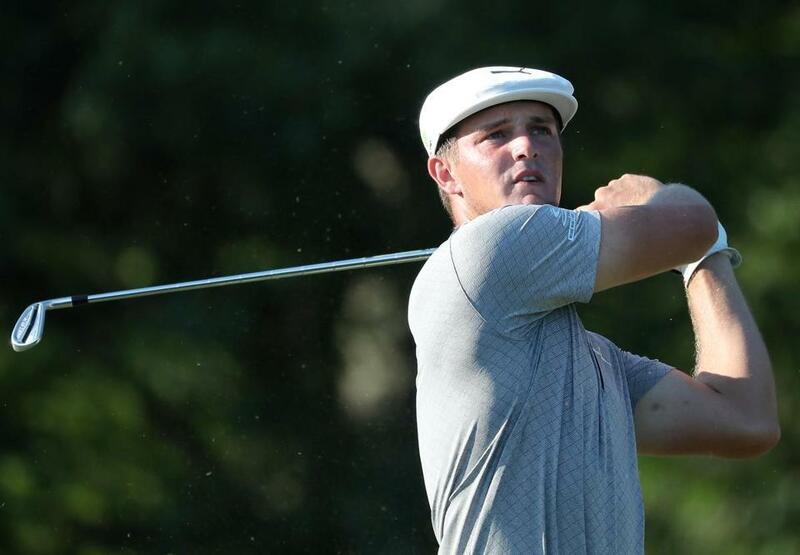 DeChambeau won his second straight PGA Tour playoff event with a 2-shot victory at TPC Boston. He validated his unique approach to the game. It might not work for everyone. It might not even work for anyone else. But it sure works for him. Here he is now, taking his turn in the spotlight, the dizzying carousel of emerging young American golfers taking him on its latest spin. Others may have burned brighter — Jordan Spieth’s sprint to three major titles, needing only the PGA to complete the grand slam, Brooks Koepka’s impressive second straight US Open title followed by a third major win at the PGA, Patrick Reed slipping his arms into a Masters green jacket, Justin Thomas entering the major club at last year’s PGA, to name a few — but none is as hot as DeChambeau is now. Talk mad science all you want. This guy can golf. Bryson DeChambeau celebrates after his par putt on the 18th hole sealed his victory at TPC Boston in Norton. Sunday, he outplayed partner Tiger Woods. Monday, he outplayed the rest of the field, moving up from his starting position in second place with a birdie on the second hole, cementing his status as the man to beat with a fantastic three-birdie stretch on seven, eight, and nine, and holding off a charging Cameron Smith (who got to within one with a birdie on 16) by calmly sinking his own birdie putt on 15. Woods has come to respect the oddities of DeChambeau’s approach, because in it, Woods can still see what he knows matters most: Hard work. The two may use different terminology and be separated by almost two decades, but they managed to find plenty of common ground regardless. There was a time Jon tried to talk his son out of being so different. Now? He’s using the same single-length clubs.